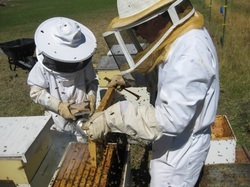 How to keep bees Beekeeping is a very fun and rewarding hobby. It takes a bit of work, but it sure is fun to eat your own honey! Since we get asked so much about how to start, we have put together some tips and resources to help beginning beekeepers. Study, study, study. Start with a good book on beekeeping. Here are some suggestions: The Backyard Beekeeper by Kim Flottum or First Lessons in Beekeeping by C.P. Dadant. You can also subscribe to one of the magazines geared towards beekeeping. Try The American Bee Journal or Bee Culture. Check your local city codes. There may be a limit on the number of hives allowed, or a minimum amount of space allowed between your hive and the property line. Don’t despair if your city doesn’t allow beehives. You can often find friends or farmers in outlying areas that will allow you to keep a beehive on their property. Just ask around. The best time to start a beehive is in the spring. This is when bees are just starting to get busy. You want to start them up as soon as the weather warms up so that they will have plenty of time to build up a strong hive. You will want to locate your hive where they have an open flight path. There will literally be thousands of bees coming and going out of the hive. A high fence will raise their flight path for neighbors. For yourself, just make sure they have 15 feet or so of space around them. (We were once eating dinner at a friend’s house. They keep their bees on the back of their property by a fence, and we were eating at a picnic table that wasn’t too near them. Unfortunately, it was right on their incoming flight approach. Those poor bees kept buzzing us on their way in—you could almost hear them saying, “Hey buddy, get outta the way!” Just keep those kinds of things in mind when you situate your hive.) Your bees will need water as well. We didn’t actually think about this until a neighbor told us about all of the bees that were gathering at her birdbath. Oops. Buy your bees. Of course, you can go out and catch a swarm. But if you are just beginning, I would order what is called a “nuc.” It is a queen with bunch of worker bees. Just stick it in and you are now a beekeeper! Keep your bees healthy. This means different things for different beekeepers, climates, seasons, etc. Ideally, you would be able to let your bees do their thing and then you just come back in the fall to gather honey. Unfortunately, it rarely works that way. You might need to feed them. Here in Cache Valley, it takes a while for the nectar to start flowing in the spring, so we sometimes need to provide a little bit of food to keep the bees alive until the flowers start opening up. This probably isn’t necessary in warmer climates (lucky!). Here are some ideas for feeding bees: http://outdoorplace.org/beekeeping/feeding.htm. We usually fill quart jars with a solution of 1:1 sugar to water. We punched holes in the top of the lid with a very small nail and then put it in the beehive. Works for us. In addition, you may need to treat for mites or other parasites or diseases. Check on your bees periodically to make sure that they are doing okay. Harvest your honey. We usually do this in the fall. But you can take out honey at other times. The easiest way is to just scoop out some of the honeycomb. Many people like to eat it just like that—honey and wax together. If you have access to an extractor, then you can separate out the honey from the wax. An extractor is basically a centrifuge, or spinner. In the fall, we take out the long, flat frames that are full of capped honey. We scrape the wax cappings off with a hot knife. We put these cappings in a bucket. The honey will gradually sink to the bottom, and the cappings can be melted down and used for beeswax candles or other things. The frames are put in the extractor and spun. The honey flows out the spigot in the bottom and into white plastic buckets. We usually place a simple metal strainer there to catch any wax pieces or bug parts. Da-duh! Beautiful raw honey.